There is a need to explain that generic versions of a drug may not be manufactured by the same process as brand-name drugs and that the different processes may have dramatically different environmental impacts. Two global forces are at odds today—the push for "greener" processes and the push for lower drug prices. This book brings this conflict into sharp focus by discussing in detail the published process chemistry for top-selling small molecule drugs. Providing insights about process route selection, choice of reagents, and reaction conditions, Pharmaceutical Process Chemistry for Synthesis guides process chemists in identifying best processes for manufacturing these blockbuster drugs as they lose patent protection. Further, it highlights the strategies and methodology that might be useful for expediting the process research and development of the blockbusters of the future. 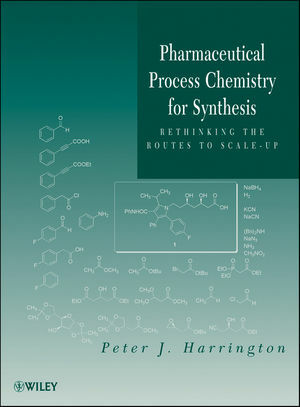 Written from a refreshingly objective perspective, this book is essential for process chemists who need to devise practical syntheses for increasingly complex drugs in a constantly decreasing time frame. Peter J. Harrington is the founder of Better Pharma Processes, LLC, a consulting firm specializing in pharmaceutical process design and development. From 1988–2008, he worked for the Syntex Technology Center, later Roche Colorado, as a research fellow. Dr. Harrington has more than fifty patents and research publications, including reviews and abstracts, as well as the book Transition Metals in Total Synthesis (Wiley). 4 Efferox XR® (Venlafaxine Hydrochloride). 8 Advair Diskus® (Salmeterol Xinafoate).